MUNICH (AP) — Sadio Mane scored twice to send Juergen Klopp’s Liverpool into the Champions League quarterfinals with a 3-1 win at Bayern Munich in the second leg of the last 16 on Wednesday. 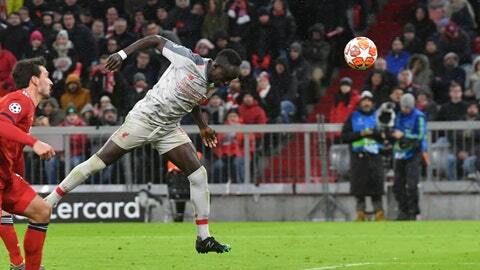 Mane opened the scoring with a delicate finish in the 26th minute and added Liverpool’s third in the 84th by heading in Mohamed Salah’s cross as Bayern desperately sought a way back into the game. Serge Gnabry had forced an own goal from Joel Matip to equalize in the 39th, but Liverpool went ahead again through a corner when Virgil Van Dijk met James Milner’s cross with a thumping header in the 69th. After a scoreless first leg, Liverpool’s win puts four English teams into the quarterfinals for the first time since 2009. Manchester United, Tottenham and Manchester City also advanced. It’s the first time since 2006 that there will be no German team among the last eight. For the first time since winning the tournament in 2013, Bayern’s campaign wasn’t ended by a Spanish team. “We deserved to lose today. Liverpool was the better team in two games. Today we were shown our limits,” said Bayern coach Niko Kovac, whose side claimed the Bundesliga lead at the weekend. Klopp, who previously coached Bayern’s old foe Borussia Dortmund, led the away fans’ celebrations after the final whistle. “I’m proud and happy, because this club deserves awareness again,” said Klopp, who also lost the final to Bayern with Dortmund in 2013 but said past disappointments played no role. But the side failed to really threaten Alisson Becker’s goal, even after Liverpool lost its captain Jordan Henderson with an apparent ankle injury in the 13th. Fabinho came on to replace the midfielder. Liverpool started slowly until a mistake from Manuel Neuer in his 100th game in the competition led to the opener. The Bayern ‘keeper rushed out of goal and Mane turned to elude him and defender Rafinha before chipping the ball into the unguarded net. Matip’s own goal got Bayern back in the game, but this time there was no heroic comeback. Bayern came from two goals down against Juventus at the same stage to win 4-2 three years ago.